A new methodology is used to design robust Weyl semimetals and to identify the most robust and ideal Weyl semimetal candidate in Ta3S2. Weyl semimetals are of great interest because they provide the first realization of the Weyl fermion, exhibit exotic quantum anomalies, and host Fermi arc surface states. The separation between Weyl nodes of opposite chirality gives a measure of the robustness of the Weyl semimetal state. To exploit the novel phenomena that arise from Weyl fermions in applications, it is crucially important to find robust separated Weyl nodes. We propose a methodology to design robust Weyl semimetals with well-separated Weyl nodes. Using this methodology as a guideline, we search among the material parameter space and identify by far the most robust and ideal Weyl semimetal candidate in the single-crystalline compound tantalum sulfide (Ta3S2) with new and novel properties beyond TaAs. Crucially, our results show that Ta3S2 has the largest k-space separation between Weyl nodes among known Weyl semimetal candidates, which is about twice larger than the measured value in TaAs and 20 times larger than the predicted value in WTe2. Moreover, all Weyl nodes in Ta3S2 are of type II. Therefore, Ta3S2 is a type II Weyl semimetal. Furthermore, we predict that increasing the lattice by <4% can annihilate all Weyl nodes, driving a novel topological metal-to-insulator transition from a Weyl semimetal state to a topological insulator state. 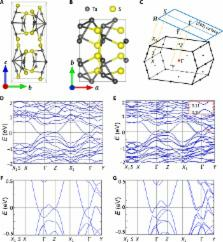 The robust type II Weyl semimetal state and the topological metal-to-insulator transition in Ta3S2 are potentially useful in device applications. Our methodology can be generally applied to search for new Weyl semimetals. Graphene is a rapidly rising star on the horizon of materials science and condensed-matter physics. This strictly two-dimensional material exhibits exceptionally high crystal and electronic quality, and, despite its short history, has already revealed a cornucopia of new physics and potential applications, which are briefly discussed here. Whereas one can be certain of the realness of applications only when commercial products appear, graphene no longer requires any further proof of its importance in terms of fundamental physics. Owing to its unusual electronic spectrum, graphene has led to the emergence of a new paradigm of 'relativistic' condensed-matter physics, where quantum relativistic phenomena, some of which are unobservable in high-energy physics, can now be mimicked and tested in table-top experiments. More generally, graphene represents a conceptually new class of materials that are only one atom thick, and, on this basis, offers new inroads into low-dimensional physics that has never ceased to surprise and continues to provide a fertile ground for applications. Fermions in nature come in several types: Dirac, Majorana and Weyl are theoretically thought to form a complete list. Even though Majorana and Weyl fermions have for decades remained experimentally elusive, condensed matter has recently emerged as fertile ground for their discovery as low energy excitations of realistic materials. Here we show the existence of yet another particle - a new type of Weyl fermion - that emerges at the boundary between electron and hole pockets in a new type of Weyl semimetal phase of matter. This fermion was missed by Weyl in 1929 due to its breaking of the stringent Lorentz symmetry of high-energy physics. Lorentz invariance however is not present in condensed matter physics, and we predict that an established material, WTe\(_2\), is an example of this novel type of topological semimetal hosting the new particle as a low energy excitation around a type-2 Weyl node. This node, although still a protected crossing, has an open, finite-density of states Fermi surface, likely resulting in a plethora physical properties very different from those of standard point-like Fermi surface Weyl points. [1 ]Centre for Advanced 2D Materials and Graphene Research Centre, National University of Singapore, 6 Science Drive 2, Singapore 117546, Singapore. [2 ]Department of Physics, National University of Singapore, 2 Science Drive 3, Singapore 117542, Singapore. [3 ]Laboratory for Topological Quantum Matter and Spectroscopy (B7), Department of Physics, Princeton University, Princeton, NJ 08544, USA. [4 ]Department of Physics, National Tsing Hua University, Hsinchu 30013, Taiwan. [5 ]Institute of Physics, Academia Sinica, Nankang, Taipei 11529, Taiwan. [6 ]Department of Physics, Northeastern University, Boston, MA 02115, USA. This is an open-access article distributed under the terms of the Creative Commons Attribution-NonCommercial license , which permits use, distribution, and reproduction in any medium, so long as the resultant use is not for commercial advantage and provided the original work is properly cited.